Can I use a hover text for each product in my payment form? Hello. I tried the work around and it partially works. I am able to create one hover that details all of the items at once. It won't, however, allow me to make individual hovers for each product (see attached). Please let me know how I can choose each of my items and apply a custom hover to each item individually. 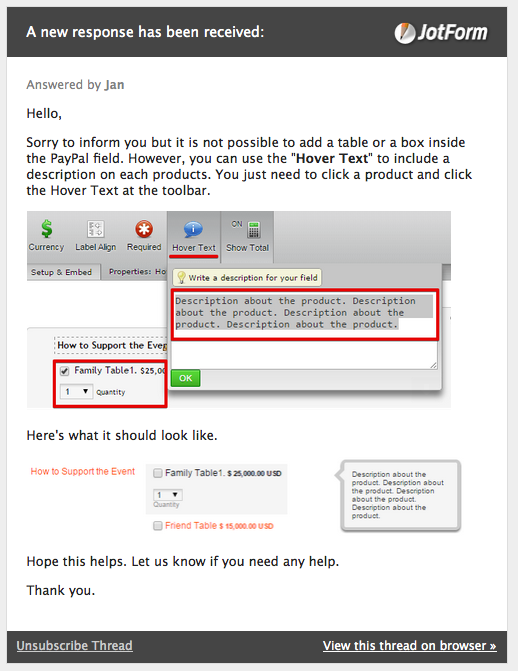 Unfortunately, the hover text option applies to the whole payment field and not on each product. If you want to display a detailed description for your products you would need to create your product list using normal fields and then use a calculation widget to calculate the amount that will be passed to PayPal. You can see a demo here: http://form.jotformpro.com/form/50796756938981 in which I included 2 of your products so you can see how it works. Feel free to clone this form into your account to check it further.